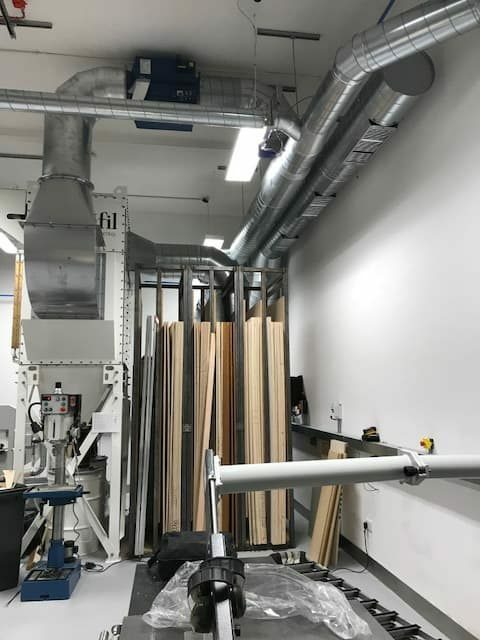 Wood dust extraction system for UCL teaching facility - Western Air Ducts (UK) Ltd. Western Air Ducts (UK) Ltd.
Western Air Ducts were approached by University College London (UCL) in late October 2017 to design a “high tech, energy efficient dust extraction system” for their new facility they were developing at Olympic Park East London, and they wanted it in by the end of the year. This timescale for a filtered extract system proved to be tricky, but we were able to utilise a new ATEX rated extract unit from our friends at Camfil APC who guaranteed delivery before Christmas to provide us with a chance to get this tricky project completed. In addition to this the guys at UCL wanted to ensure the new system was going to be as quiet as possible due to the location so a bespoke acoustically lagged fan was also used. 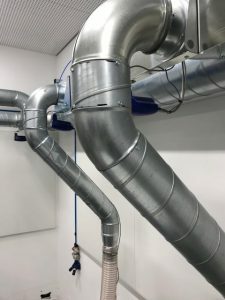 One of the original requests was for an energy efficient system to be used, to achieve this we utilised our own patented intelligent damper control system Inteliair to achieve this. We used pneumatic controlled dampers to provide optimum closing times on the 11 individual extract points, in conjunction with this each point was controlled by a current sensor to ascertain when each machine is in use or not. 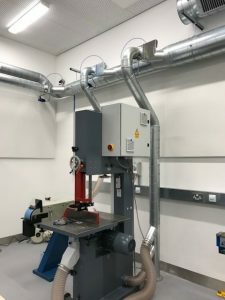 The benefits of this system would ensure through the variable speed drive connected to the 22KW fan that only the machines being used had extraction provided whilst regulating the fan speed for optimum performance, providing an energy saving system that also ensures the system is as quiet as possible which was important to the end user. Whilst working in London on a big project provides its own unique challenges especially so close to Christmas, we were able to complete on time to ensure students coming back from the Christmas break could use the impressive new facility UCL had provided them.